KAREN SLADEK, daughter of the World War II letter writer, lives with her husband on a beautiful island thirty-five minutes by ferry from Seattle. A graduate of the University of Montana, she interrupted a successful career in business to pursue writing. The shift resulted from her discovery of a box of World War II letters, photos, and documents�long forgotten on a closet shelf in the home of her parents. 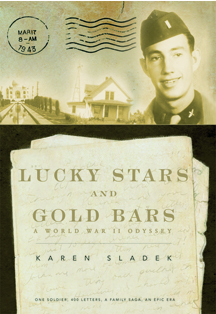 Fascinated by her father�s global odyssey in the World War II Army Air Corps, she felt inspired to make the historical treasure trove available to the public. She is pleased to share her father�s personal story in an impersonal war with the children and grandchildren of those who served in the armed forces during the Second World War.